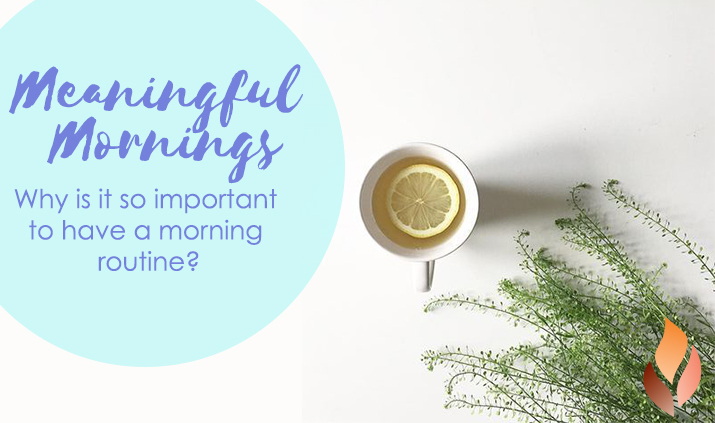 Home » Events and Blogs » Blog » Meaningful Mornings: Start your day the right way! Meaningful Mornings: Start your day the right way! Mornings can be tough. Maybe you like to sleep in as long as you can, and end up getting ready for the day by running around your house like a crazed animal. Maybe you have a basic routine you’ve been cycling through for years. Maybe you work from home and get to work right after splashing water on your face and brushing your teeth. According to psychologist and Psych Central blogger Elisha Goldstein, Ph.D, in his newest book Uncovering Happiness: Overcoming Depression with Mindfulness and Self-Compassion, our mornings set the stage for the rest of our days. So when the day is filled with bumps, a good morning can help us navigate those challenges. Cultivate a gratitude practice.Ask yourself: What do I have to be grateful for right now? This could be anything from seeing the sunrise to having a comfortable bed to having a roof over your head to having a heart that beats. Say this silently to yourself, or say it aloud. Keep a journal, or use an app. Be present in your morning activities.When you’re taking a shower, focus on being in the shower — instead of thinking about solving problems at work. When you’re making breakfast, remind yourself that this food nourishes you and your family. When you’re leaving the house, say an intentional good-bye to your pets or any family members and look into their eyes. Think about what you need your mornings to look like and how you’ll respond to those needs. For instance, if you need calm and quiet, try a short meditation practice. If you need inspiration, read from a book of affirmations or write a few lines of your own. If you need a release, write in a journal. If you need to have fun and feel energized, turn on your favorite music and dance your way through the morning’s tasks. If you need more time for yourself, try to wake up earlier and do what you’re passionate about. If you like, spend today considering your ideal mornings and how you can make them happen. Because focusing on self-care right from the start is powerful and prudent. And because focusing on self-care right from the start feels good. What do meaningful mornings look like for you? How can you prioritize self-care as soon as you open your eyes? How can you create such meaningful mornings?